With the construction project due to reach its “substantial completion” stage in a little more than a month, the construction contractor and its subcontractors are working extra shifts and Saturdays to complete remaining tasks and especially tasks on the lower floors. Crews from Schindler Elevator Co. are very close to completing work on both elevators #1 and #2, and the sump pumps required for the bottom of each shaft were ordered for installation this week. It is technically possible that at least one of the additional elevators could be back in service within a week or so, if the city's elevator inspector approves. As of this afternoon, cement had still not been poured for the complex fabrication of the 5th and 6th floor stairs in the central stairwell. This project has been in stasis for the past month as engineers, architects, and project managers have gone back and forth over its requirements. Once the cement is poured it may need to cure for 21 days before the forms are removed and the stairs can be finished. Thus, the central stairs may one of the last projects completed in the main construction timeline. Meanwhile, there has been a lot of work activity related to electrical circuits and smoke control system dampers around the interior air shafts adjacent to all of the building’s stairwells. Basically, the building's new HVAC system is now running on automatic controls but not yet at preferred temperatures and relative humidity consistently throughout the building. As predicted the building has warmed after introducing hot air into the mix, but the engineers on the project think they are getting closer to working the kinks out. Still, two things need to happen before the system can be correctly balanced: (1) the engineers and technicians need to complete the work needed to identify and fix faulty pneumatic thermostats, disconnected or undersized horizontal pneumatic mains, faulty actuators on VAV boxes, and frozen or locked up damper shafts on the lower floors and (2) they need to complete work on the replacement or repair of smoke control dampers leading from the overhead air duct in the ceilings to the vertical duct in each of the building’s interior chases by each stairwell. All this could take a couple of weeks, but some gradual climate improvement should be noticeable before then. The construction fence occupying Newcomb Place has been been removed, the area within mostly restored, and parking places restriped (repainted). The area was reopened for parking by Tulane Public Safety yesterday. Meanwhile, crews have begun to dismantle the temporary main entrance on the Freret Street side of the building that served the library during the earlier stages of the construction. Along the back of the building crews have almost completed the removal of the remaining pieces of the galvanized steel towers and other equipment from the temporary HVAC that served the library since January 2006. Construction building codes require new stairs for the building's three emergency exits and this will require piles to be driven. 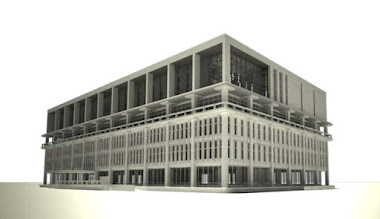 Likely next week, the first set of piles will be driven on the west side of the building adjacent to door exiting the center of the Technical Services area on the library’s 1st floor. Those stairs will require 4 piles, 30-ft in length. Next a set of two piles will be driven for the exit on the Freret Street side of the building, and this is tentatively scheduled for Sept. 28. Two more piles for the exit on the Dixon hall side of the building could be driven on either date, depending which pile driver on site at the time is determined to be most suitable for that location, which is squeezed within the contractor’s newly compressed construction staging area. Almost all the shelving for the upper floors has been delivered and on the 6th floor most of it has already been installed. The 5th floor installation is next. Furniture for the upper floors is expected to begin to arrive early next month and deliveries will be scheduled through the remainder of October. Only minor details in the FF&E (Furniture, Fixtures, & Equipment) process still need to be wrapped up. Tulane Technology Services is assisting with the preparation of specs to seek bids for computer equipment in the 5th and 6th floor elevator lobbies and instructional technology equipment for the two classrooms on the 6th floor. Since the library's the new HVAC (heating, ventilating, and air conditioning) system was activated during the first weekend in August, the process of balancing the system to produce proper temperature and humidity levels has proven to be a long and challenging process. For about two weeks after the switch from the old "temporary" system, temperatures in the building were too warm--often near or above 80 degrees in some areas. Eventually, engineers and technicians from two companies, the mechanical/electrical subcontractor MCC and the automation engineering firm Siemens, succeeded in getting air flowing from all the new HVAC blower units and with a sufficient flow of campus chilled water. 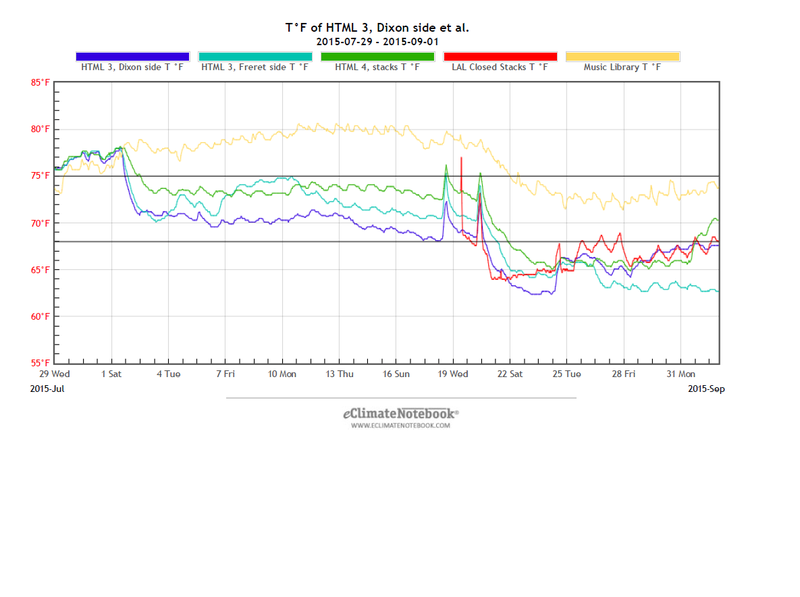 This produced the opposite problem, with temperatures falling to the mid and low 60s, and even lower in one location. 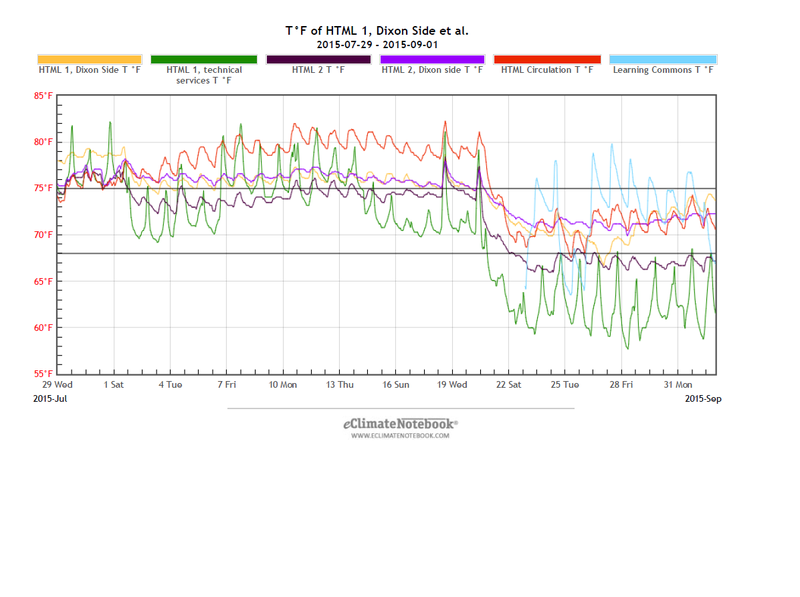 The adjustments at that point did produce lower levels of relative humidity, which was a positive step. Yesterday the engineers and technicians began to mix steam (heat), generated from the campus physical plant, with the cold air circulating through the new HVAC system components. In some areas warmer air has already been emitting from air vents replacing the very cold air that had been circulating during the past couple of weeks. This could result in a subtle moderation of temperatures or, until the system is correctly balanced, it is entirely possible that some areas may become too warm. The library's climate monitoring group (in operation since the library reopened after Katrina) is continuing to collect temperature and humidity readings to monitor the building's climate in multiple locations on all four lower floors, and is sharing these data daily with the construction project managers. Meanwhile, the new mechanical system on the 5th floor basically connects to older duct and controls that for ten years have been dormant on the lower floors. An MCC crew has been surveying the building to identify faulty pneumatic thermostats, disconnected or undersized horizontal pneumatic mains, faulty actuators on VAV boxes, and frozen or locked up damper shafts. They have developed a plan for repairs, which should address the remaining problems with distributing air flow throughout the lower floors. Siemens technicians have begun replacing about 30 faulty thermostats that had already been identified and more will be added to their list as MCC completes its survey. Some of the new thermostats needed are in office areas; the plan is for the work to be scheduled in advance as much as possible to give fair warning to occupants. Work has progressed relatively quickly on the removal of the old temporary HVAC system with its tubes and towers, and this includes glass replacement or repairs where overhead air distribution tubes ran through transoms, ceilings, or walls. Chilled water pipe and the older blower units have been removed from the back of the library building. Workers have begun separating the old towers from the building, as the first stage in the tower removal. 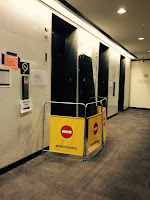 The library has been limping along with a single elevator since last November, in a phased operation in which all three elevators have been rebuilt and extended to also serve the new 5th and 6th floors. 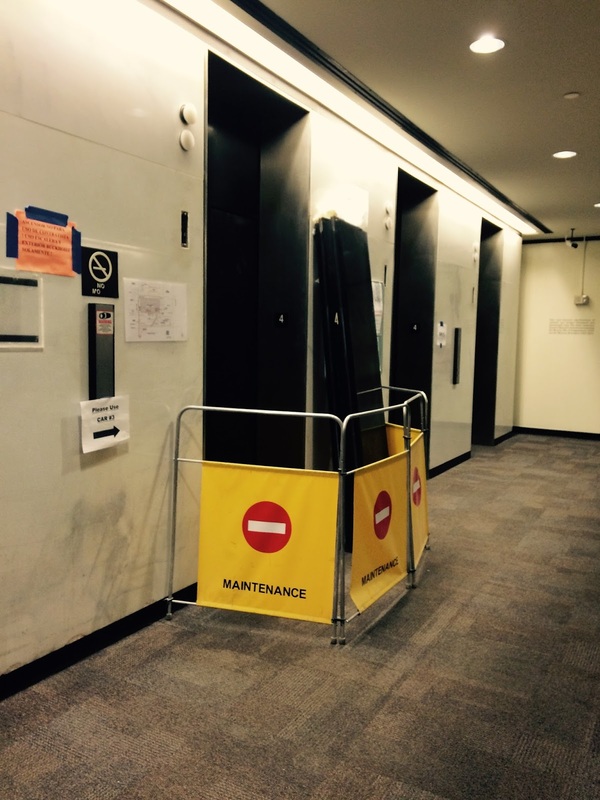 The other two elevators are now functioning and capable of traveling from the basement level to the 6th floor. Remaining work includes installing new elevator doors, modifications to the interior of each elevator car, and the installation of sump pumps required for the bottom of each shaft. The city inspector who will be reviewing the elevators before issuing certification allowing them to be operated for public use is being contracted in advance now in an effort to identify any potential obstacles to quickly passing inspection when the time comes, which is hoped to be soon. Several tasks were successfully coordinated last week to allow for a switch back to the library's original main entrance that faces Newcomb Place. First the construction contractor needed to dramatically reduce the size of the fenced construction zone in front of the library building and between the library and Jones Hall. Then a technician from the 3M Corporation, through which the library maintains a service maintenance agreement, needed to be scheduled to travel from Minnesota to New Orleans to disassemble of the security gate at the temporary Freret Street entrance and reinstall the gate at its original location. Then the original automatically-opening front doors needed to be reactivated and the temporary doorway onto Freret Street closed. The entrance switch over took place with little fanfare last Tuesday afternoon. The main entrance to the library had been temporarily moved way back in October of 2012, at the very start of the project, to the Freret Street side of the building. The change back to the original entrance can be seen as another tangible sign that the construction project, set to end later this fall, is finally nearing completion. The construction contractor plans to begin removing most if not all of the construction fence still occupying Newcomb Place on Sept. 7 or shortly thereafter.